Vegan pumpkin pie is a delicious treat that contains no animal products whatsoever. Pumpkin pies normally use dairy ingredients and eggs, but with a few simple substitutions, this traditional favorite can easily be transformed into a dessert fit for vegan diets. A pumpkin pie consists of what is essentially a baked pumpkin custard, nestled in a sweet pie crust. Both elements of this dessert can pose problems for vegans. Pie crusts may contain butter or lard, which are animal products. The filling is even more tricky, as it relies on eggs to bind everything together, and milk or cream to give it that creamy texture. The challenge is to find substitutes for the animal-based ingredients that will still impart the same flavors and textures as a traditional pumpkin pie. Many traditional and popular baking substitutes in vegan kitchens can give less than desirable results. Many bakers insist that a pie crust must be made with lard or butter in order to achieve a flaky but not overly crumbly result. The good news is that the fats in pie crusts don't have to come from animal-based sources. Non-hydrogenated margarine can be used effectively in pie crust recipes, adding a slightly buttery taste. Vegetable-based shortenings, however, give a much better texture overall. For both a buttery flavor and a pleasing texture, try a combination of two parts shortening to one part non-hydrogenated margarine. Vegetable based oils can also be used to make pie crust, but the texture will suffer and the end result can be slight greasy. If you decide to use oils, such as canola, add up to one cup extra flour than called for in your recipe to absorb some of the oil and greasiness. All other ingredients, like salt and water, should stay the same. 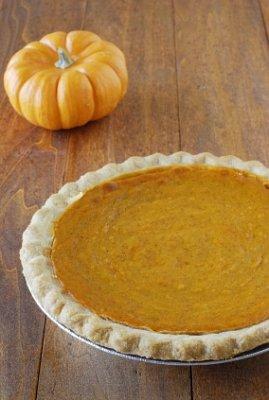 Vegan pumpkin pie filling can be made using blended tofu as a binding agent, and to give the filling a creamy texture. Since tofu takes on the flavor of whatever it's being cooked or baked with, this is a good way to keep the taste of the filling intact. The downside to using tofu in the filling is that the texture of the pie once it's been baked can be much different from a traditional pumpkin pie. It would be difficult to pass the finished dessert off to non-vegans as an acceptable substitute. Soy milk is another common addition to vegan pies. If you decide to use soy milk, choose the sweetened variety and add a little salt. Cow's milk has a higher sugar and sodium content than soy milk, and you'll need the extra additions to bring out the flavor of the finished pie. Depending on what you have on hand and your own preferences, nut milks or rice milk can be used as the liquid in a pumpkin pie. These types of milk have distinct flavors though, so choose wisely, keeping in mind that they will be incorporated into the finished pie filling. Hemp milk can be harder to find than soy or nut milks, but it's thicker and has a less distinct flavor. A thicker milk product improves the creamy texture of the pie. Brown Rice Syrup - Brown rice syrup is quite thick, and has a rich caramel flavor. Adding one or two tablespoons to your pie filling can bring out the taste of the pumpkin and spices, bind the filling together, and add a touch of extra sweetness. Egg Substitutes - Egg substitutes can come in liquid or powdered form. Usually the powdered egg substitutes, such as Ener-G Egg Replacer, are mixed with water before using. In pie filing, however, you won't really need the extra moisture from the water, so go ahead and add the powder straight into the mixture. Flour and Grain Meal - You choice of flours will affect both the crust and the filling. Whole wheat flour can be used in the filling, since you'll only need a couple of tablespoons. Pie crust with whole wheat flour, however, will be too dense and heavy. Grain meals, like flax or corn meal, will impart a grainy texture to your filling, and should be avoided. Karina's Kitchen - A crustless pie using buckwheat flour. Vegan Connection - Spicy pumpkin pie filling. Boutell - Includes an old-fashioned pie crust recipe, and a filling using tofu.